The Clarendon Hills Middle School Parent-Teacher Organization raised more than $9,000 Wednesdayat the school's third annual Pizza Wars and Eagle Jam talent show. Attendees paid $15 for a ticket, which allowed them to sample pizza from eight vendors and vote on their favorite while watching and listening to students perform during the talent show. Newcomer WoodGrain Neapolitan Pizza from Westmont edged out previous winner Home Run Inn for the top spot in the competition. 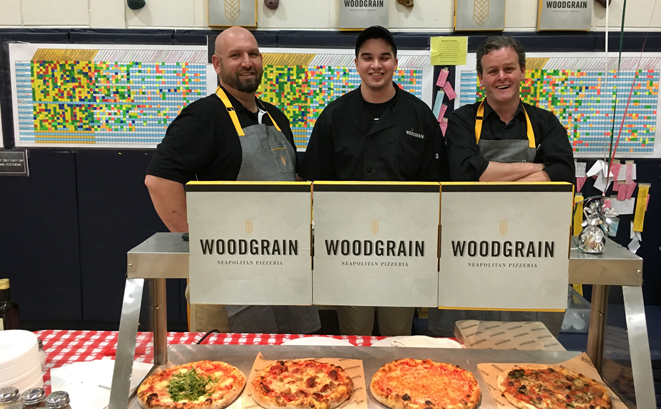 Principal Griffin Sonntag said all Hinsdale-Clarendon Hills Elementary District 181 students and parents were invited to Pizza Wars, but most who came were from CHMS and 5th-graders from feeder schools Walker, Prospect and Monroe. "We had a lot of 5th-graders," Sonntag said. "We reached out to the 5th-grade parents to use this as a transition for kids who will be coming here in the fall. We had a bunch of kids show up in baseball uniforms and buy tickets at the door. I'm sure they must have decided to come here when it rained." Eighth-grader Luke Moran came the past two years for the pizza, but this time was an emcee and sang a song for the talent show. "I didn't get to have any pizza this year because I was busy with the show," he said. "It was fun, and I think we get more people to come out for the show because there's pizza." Fellow 8th-grader Emma Gordon shared emcee duties, played a song on guitar and sang with a trio during the talent show. "The whole thing is kind of awesome," she said. "Everybody loves pizza. I guess the only bad thing is that some people are busy eating and talking, so they don't really pay attention to the people performing. But it's still a lot of fun for everyone."